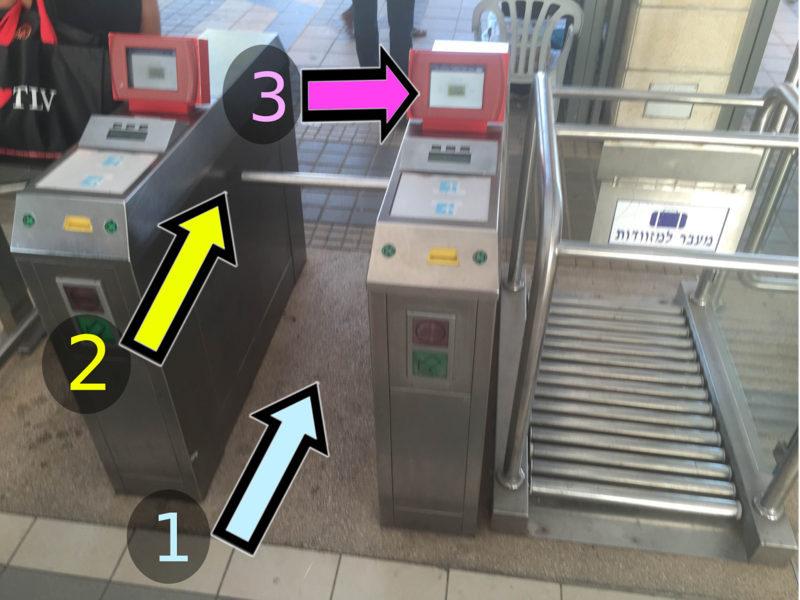 It does not take a UX expert to see that the electronic ticket validation system in Israel Railways is poorly designed. - The passenger walks along the lane (1). - The rotating bar (2) lies about 70cm above ground, and is locked in position until the ticket is validated. - The passenger presses the ticket against the screen (3). - The ticket is successfully validated, the passenger pushes the bar (2) that subsequently rotates to allow the passenger to enter the ramp. Well, it doesn't exactly play out that way. About 50% of the time the ticket isn't validated correctly and the rotating bar is locked in place, leaving the passenger stumbling against it, delaying a group of annoyed people standing behind him or her. 1) The ever-so-gentle beeping sound is inaudible in any average train station. 2) The screen is parallel to the passenger's field of vision, so one has to bend backward to see it. 3) The screen is often blocked at this point by the passenger's own hand holding the ticket against it to be validated. 4) The screen is almost always dirty because - again - this is where people stick their hand/wallet to validate. All this together means that every other passenger gets stuck in the lane. It takes a couple of seconds to figure out that waiting a bit longer isn't fixing it, thereby delaying all other passengers. To top it all, every subsequent validation attempt takes a couple of seconds more than it should - due to the same design flaws. I get annoyed all over again just writing this! Mind you, this is not some ground-breaking product that provides completely new design challenges. It's not as if trains or electronic tickets were invented by Israel Railways. Rather, there are tons of examples to research from all over the world! It's one of those cases where poor design makes hundreds of thousands of people's daily routine just that much more annoying, as we are helplessly victimized by the laziness and just general inadequacy of others.